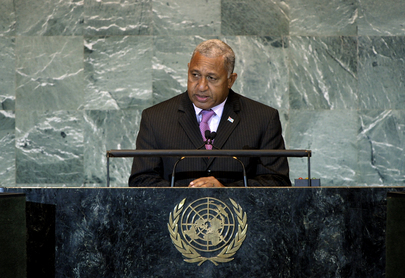 JOSAIA VOREQUE BAINIMARAMA, Prime Minister of Fiji, said that in the past year his country had opened its first diplomatic mission in Africa and joined the Non-Aligned Movement, among other positive developments complementing its “Look North Policy” and its intention to expand relations with non-traditional partners. As per its guiding People’s Charter for Change, Peace and Progress document, Fiji had also formalized diplomatic relations with 37 countries this year, and continued to participate actively in United Nations peacekeeping missions, including in Iraq, South Sudan, Abyei, Darfur, Liberia and Timor-Leste. It was also currently chairing the Melanesian Spearhead Group, and as a member of the United Nations Special Committee on Decolonization, Fiji continued to call for the effective monitoring and assessment of New Caledonia’s Noumea Accord. He said his country’s development efforts continued to be inspired by the Millennium Development Goals. The Government was focusing on national infrastructure development under its “Roadmap for Democracy and Sustainable Socio-economic Development”, which gave priority to expanding rural electrification, providing access to clean water and national roads. National laws had been reformed to align with the Convention on the Elimination of all Forms of Discrimination against Women and the Convention on the Rights of the Child, he said, and consequently, increasing numbers of women were participating in local decision-making bodies, while greater numbers of women and girls were enrolling in tertiary education. The welfare system was also providing increased assistance to the most marginalized, including single mothers, he said, adding that the 2010 Domestic Violence Decree was also being implemented effectively. He went on to say that Fiji’s HIV/AIDS Decree had been acknowledged as among the world’s most progressive HIV-related laws. Additionally, the country had recently enacted the Mental Health Decree, based on World Health Organization (WHO) guidelines, and a Child Welfare Law that created a system of mandatory reporting of child abuse by doctors, police officers and lawyers. Fiji was also undertaking key actions to address non-communicable diseases, including participation in a pilot salt-reduction programme. At the same time, economic reforms had produced positive mid-term results, he said, noting that the credit rating agency Standard & Poor’s had raised its assessment of the country’s status last month. He thanked Fiji’s development partners for their support, which had contributed to that improved rating. Nevertheless, as a small island developing State, Fiji remained vulnerable to the adverse effects of climate change, he said. While holding firm to its hope for a successful outcome to climate change negotiations, the Government also hoped that the presidential statement issued by the Security Council in July would enable that body to investigate further the plight of countries most at risk of losing territory due to climate change. It was imperative that the International Seabed Authority remain vigilant in safeguarding the environmental integrity of the world’s seabed, he emphasized. He welcomed the decision by the Authority’s Council to approve applications by Tonga and Nauru for the exploitation of polymetallic nodules in the Mid-East Pacific Ocean and underlined that Pacific small island developing States had a legitimate right to that oceanic resource. He went on to note that Fiji would, from September 2012, turn its attention to developing a new constitution, adding that the terms of that process required an end to racial categorization and discrimination. That would, in turn, allow Fijians to go into the 2014 elections on the basis of common and equal suffrage. That would be real progress, he stressed, pointing out that it would undo decades of undemocratic laws and policies inherited from the country’s colonial past.